Libertarians tend to have ‘scarce’ opportunities throughout the year to network with one another. 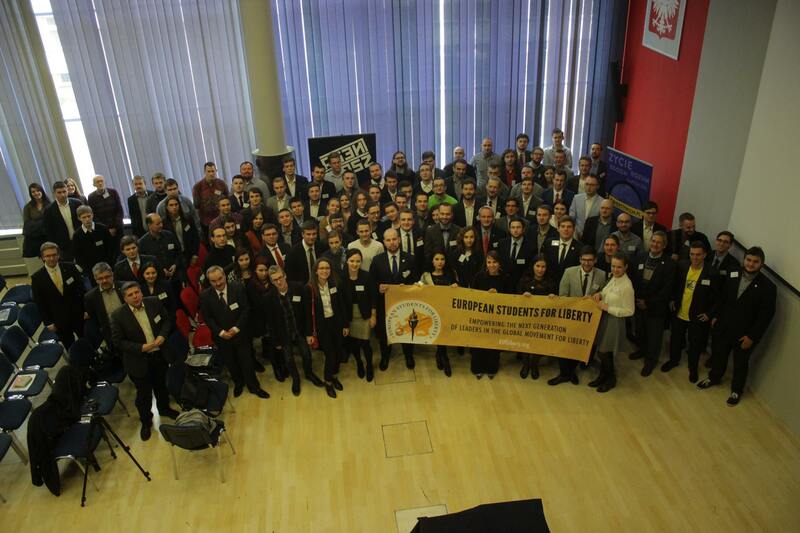 Most of these chances are put on by the European Students for Liberty (ESFL) organization, and they never disappoint. The Regional Conference took place in Katowice (Upper Silesia, Southern Poland) on Saturday, December 19, 2016 from 9am to the late hours of the night. Although it may not have been as spectacular as the main European conference in Prague, just 8 months prior, there were some highlights and it was arranged, as always, delightfully. Since libertarians love ‘free’ things, let’s begin with those. First of all, the entire conference was free of charge, including three meals, all lectures, some materials (books, leaflets, etc.) and a social at a conveniently located club nearby, with a voucher for one free drink. Unlike the food in Prague, which we must confess, was subpar, the chow was abundant (just like in a free market) and scrumptious. Once the lectures began, the audience of about 80 people was not let down. Marcin Chmielowski (Freedom and Entrepreneurship Foundation), Kamil Cebulski, Hendrik Hagedorn, along with the great Lawrence W. Reed (Foundation for Economic Education) greeted us with speeches that captured the attention of the onlookers. Apart from the speeches, we had two panels; one was entitled ‘End the Nanny State’, which included Marek Tatala, Michal Sindlar, Glenn Cripe and Alfredo Pascual, who all cleverly debunked the myths of governments’ intervention in our personal life. Following that, a panel on ‘Autonomy of regions’, comprising experts on Silesia (Tomasz Słupik), Montenegro (Slobodan Franeta) and Stowarzyszenie Libertarianskie’s own Przemysław Hankus, who especially enlightened the participants with his far reaching knowledge of the region of Catalonia. All in all, the event was an excellent time to meet with other liberty-loving people, gobble up some delicious food, and hear some knowledgeable speakers present subjects that help promote libertarian ideas. We thank ESFL and hope to see everyone again in Prague as well as during the next ESFL Regional Conference hosted in Poland.